Pounds and pounds of deliciously sweet cherries from your patio. Here's a superb sweet cherry that's been specially raised for patio growing. This selection is a naturally compact form and is also grafted onto a dwarfing rootstock so will give a shortish easily contalled tree in a large pot or planter. You'll get a super crop of shiny dark red, deliciously sweet, cherries the largest often reaching an inch or more across! It's a complete luxury to eat them at their best, fresh from the tree when warmed by the sun! This Little Stella 'Lapins' is easy to grow, resistant to cracking and is self fertile and totally hardy in the UK. And remember you'll have a beautiful display of fragrant cherry blossom in springtime too! Here's a superb sweet cherry that's been specially raised for patio growing. Little Stella 'Lapins' hails from Canada and is considered to be an improved Stella which is one of its parents. This selection is a naturally compact form and is also grafted onto a dwarfing rootstock so will give a shortish, easily controlled tree in a large pot or planter. You'll get a super crop of shiny dark red, deliciously sweet, cherries the largest often reaching an inch or more across! It's a complete luxury to eat them at their best, fresh from the tree when warmed by the sun! 'Lapins' is easy to grow, resistant to cracking and is self-fertile and totally hardy in the UK. And remember you'll have a beautiful display of fragrant cherry blossom in springtime too! Supplied as a grafted tree 80-90cm tall in a 4L pot, can be planted out all year. Dormant in winter, so no leaves on. 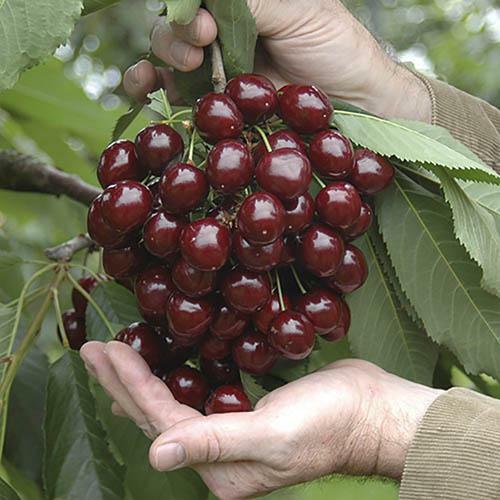 Keep well-watered to ensure the best crop of delicious cherries. Best grown in full sun.If grown in pots keep well watered. Apply a low-nitrogen fertilizer such as 5-10-10 in early spring, about a month before flowering. Prune young cherry trees during winter dormancy to shape them into an open center or central leader shape. Mature trees will just need a simple prune to remove dead or crossing branches or to open up the center or maintain shape.